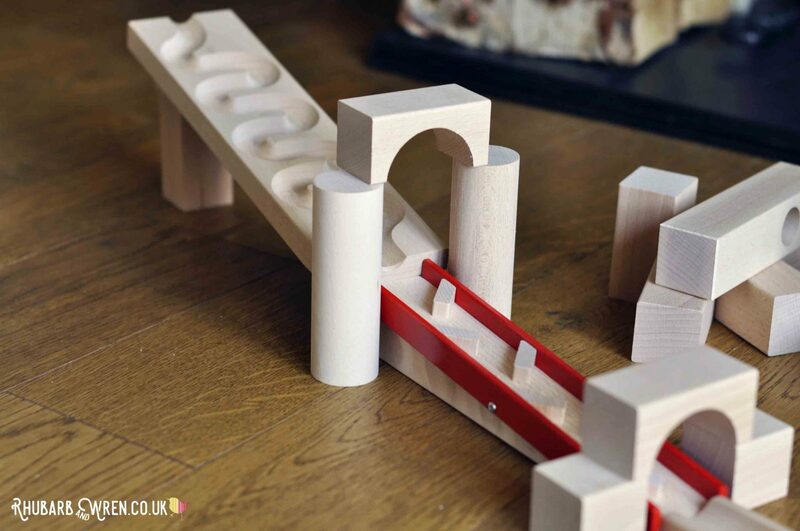 Everyone loves a marble run, right? That hypnotic race of a marble through a maze of tubes or track, winding its way through to come shooting out at the bottom. But there’s much more to marble run play than that, and the true benefits aren’t really in having an end product of a finished track (no matter how impressive), or even in that exhilaration and pride kids feel when a marble makes it all the way through. 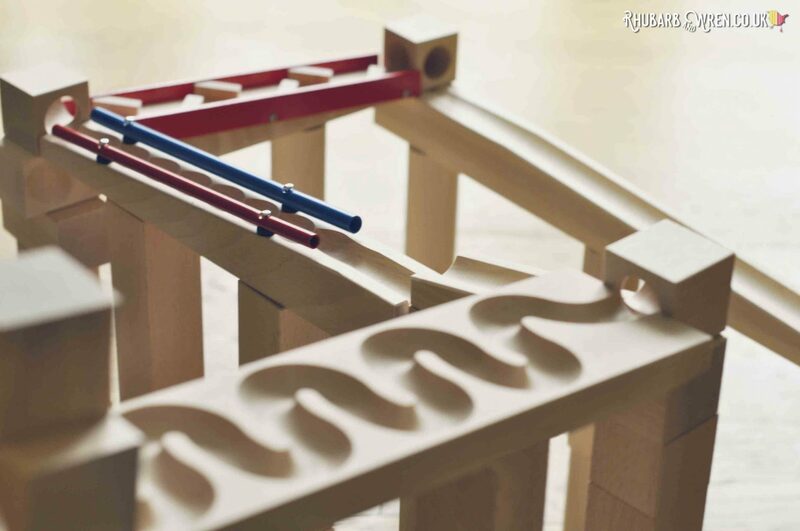 What really makes a marble run a great developmental toy for kids is, of course, the actual process of construction, and the challenges that this activity poses for them. 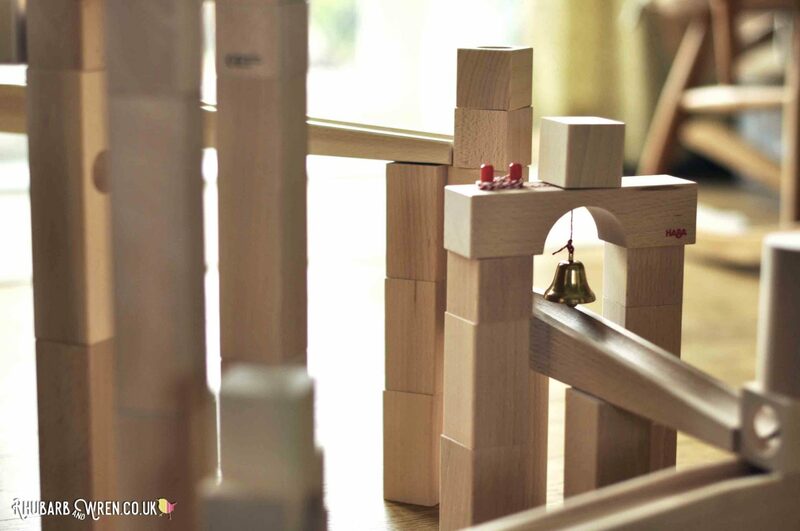 A marble run offers children many challenges to overcome. Even when very young children* are playing with simple marble run-style ball tracks, they are discovering and exploring cause and effect, gravity, and momentum. They can start to understand the properties of spheres (they roll! They roll fast downhill! They don’t roll uphill…) and also explore different shapes, weights, and colours (depending on the set), as well as grasping simple concepts like up and down, connections, direction and paths. *Very young means under three – at this age children may still be tempted to put marbles or other parts of the toy in their mouth. For under threes, you can get chunkier runs that use large balls too big to be a choking hazard instead of marbles. For example, we love the look of this musical ball track set (affiliate link), from HABA, which allows very young children to experience this kind of play safely. Building a marble run is a great engineering challenge for kids. As children progress onto building more complex or freeform runs, they will face engineering and physics challenges creating a working route for their marbles, maintaining a stable structure, and using deduction, logic and analysis to solve problems and overcome obstacles. All of this also requires and helps develop good hand-eye co-ordination and fine motor skills too. Exploring through play is the best way for kids to learn how things work. 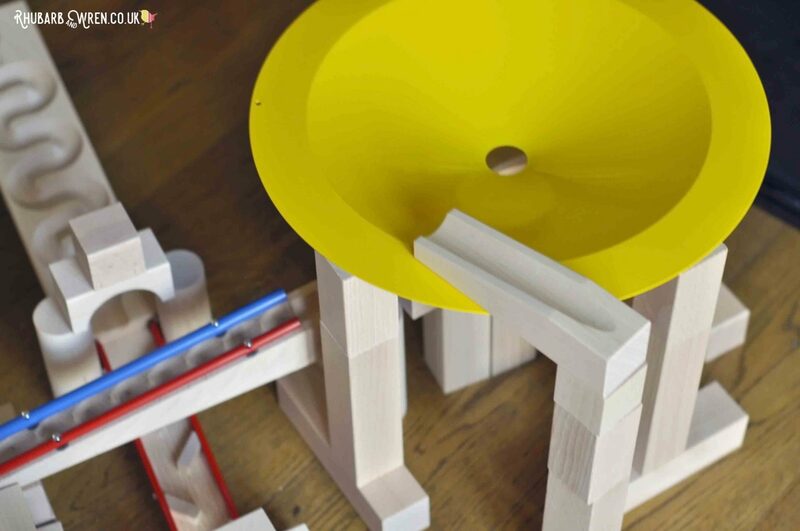 Marble runs are the ultimate open-ended toy – they promote creativity because with many sets there are countless ways to construct the marble run; it takes imagination and spatial skills to picture what you want to build in three dimensional space, and then construct it. It takes perseverance and patience to get to that final moment of truth when the marbles can be launched. And because it’s often not easy building a marble run, kids are also building their self esteem and confidence as they play. As kids get more confident, their creations tend to get more complex! 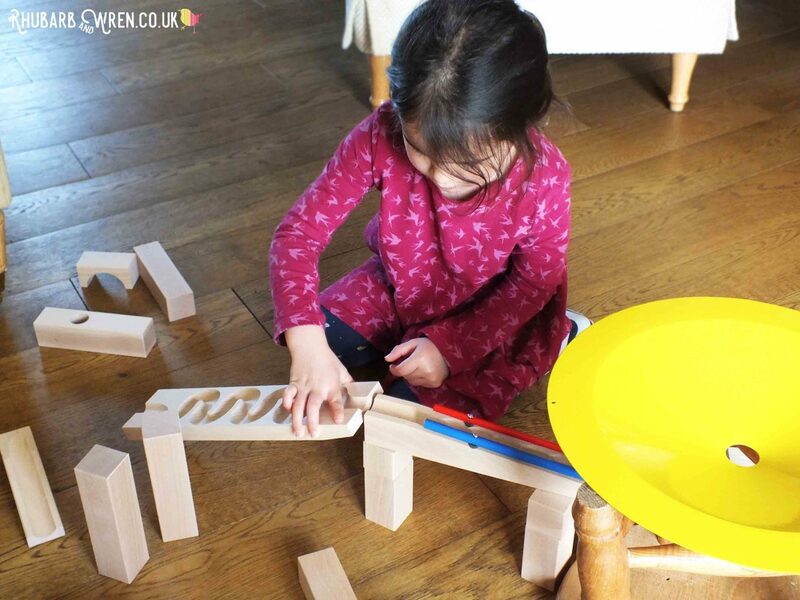 Marble runs are also often collaborative – one of the advantages to getting a bigger set like the one pictured (which we were given for the purpose of review by HABA) is that more than one child can play at a time. This, of course, has its own challenges and helps develop co-operative skills of communication, discussion, negotiation, compromise and those all-important skills of patience and perseverance that are so vital to successful teamwork. All this, and that’s without additional educational applications that you can introduce into the play. Problem solving is a key part of marble run construction. When children are challenged with, for example, creating the fastest/longest/tallest routes, or given limited components or specific start/end points they will need to consider and apply mathematical and physics principles to determine how to do this. With or without adult involvement (and let’s face it, it’s often hard to keep the grown-ups away! 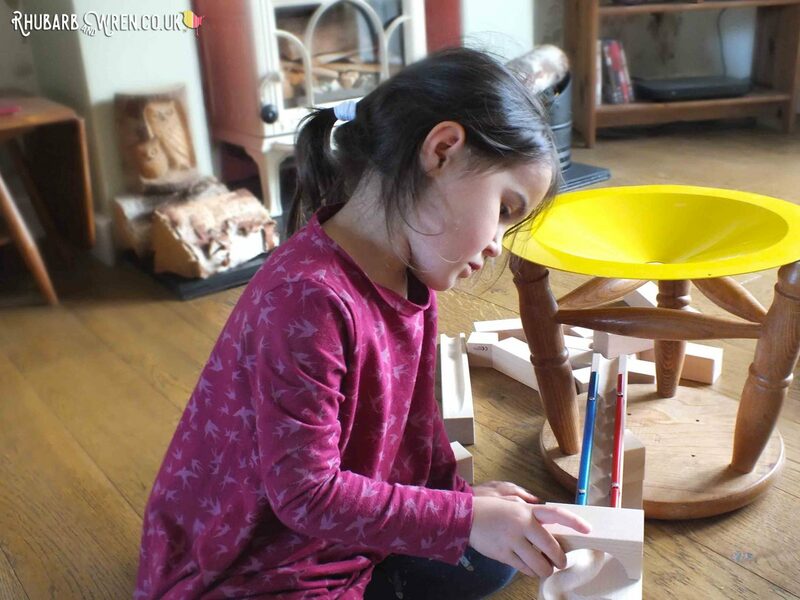 ), marble runs promote the type of play that is full of active learning. Children have to think about what they are creating, using focus, imagination and problem-solving skills all while having fun. A marble can teach kids a lot about momentum and gravity, just by doing what a marble does. If you’re looking to buy a marble run for your children, there are many fabulous options on the market. It’s worth remembering the ideal of open-ended, imaginative play when choosing one – though some look fantastic with extra elements like lights and sounds and special obstacle pieces, if the construction is limited to clicking together a few pre-set designs then kids will likely lose interest pretty quickly, and in any case will not face those construction challenges that actually help them learn and grow. This can be as true of some wooden sets as well as the (generally cheaper) plastic sets. Building a marble run takes persistence and patience, as well as focus – great skills for kids to practice! Is it robust? Some cheaper sets can be made of flimsy plastic that makes it difficult to build stable structures, and may be easily broken. We found these to be a false economy for us – one of this kind broke quickly after very little play and a lot of frustration. Can the pieces be combined in any way kids want, or is there a set structure to build? Blocks or tubes that click or slot together can make it easier to build, but this sort also allow for less open ended play and free-building. Consider which is your priority. Are there a good variety of basic track pieces? Different lengths/inclines, corners and/or direction turners etc. Plus a good proportion of supports to raise the track off the ground. You need a lot more supports than track pieces! Variation makes for more possibilities when building, and obviously adds loads to the fun. If it is a wooden marble run, are the tracks sloped? We were given a small but lovely-looking painted wood set a while back, and while it looked and felt great it was really difficult for the kids to build with because ALL the tracks were absolutely level. That one was just a little too frustrating for us! Are there at least one or two ‘special’ pieces? These are great fun and can often inspire kids to look for or make their own ‘specials’ out of found objects around the home. Noisy/musical sections are very popular in our house! Is the set expandable? Good quality (though usually more expensive) brands often have compatible sets or add-ons that can extend play options and help prolong the toy’s use. These also make great options for gifts come birthday or Christmas! 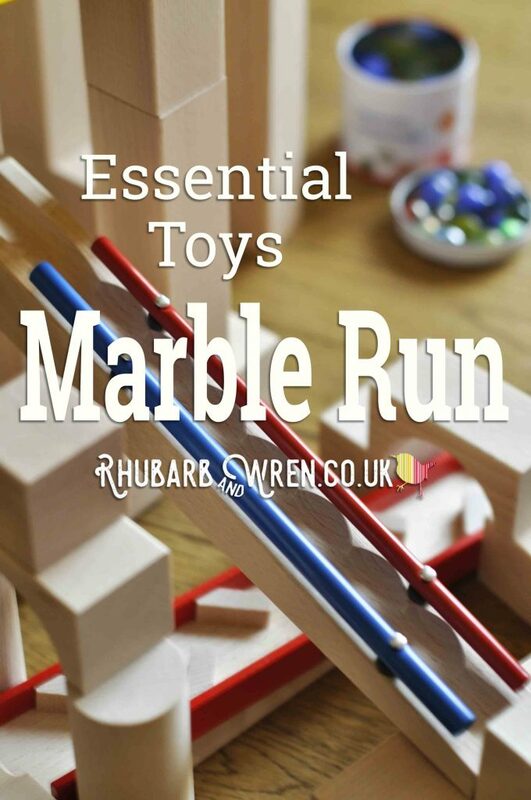 There you have it – our guide to the greatness that is marble runs, and our top tips for what to look for when buying your own. 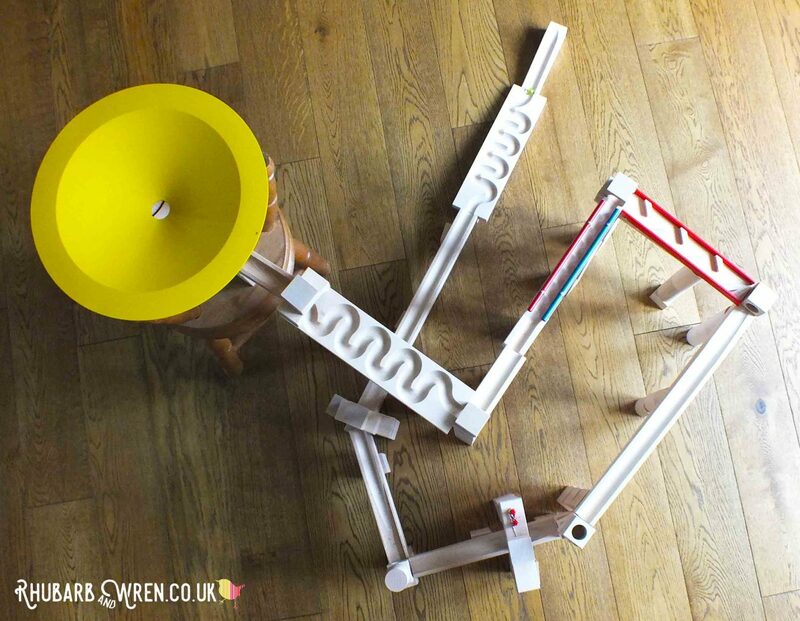 We’d love to see how you use your marble runs, too, so feel free to show us your creations! 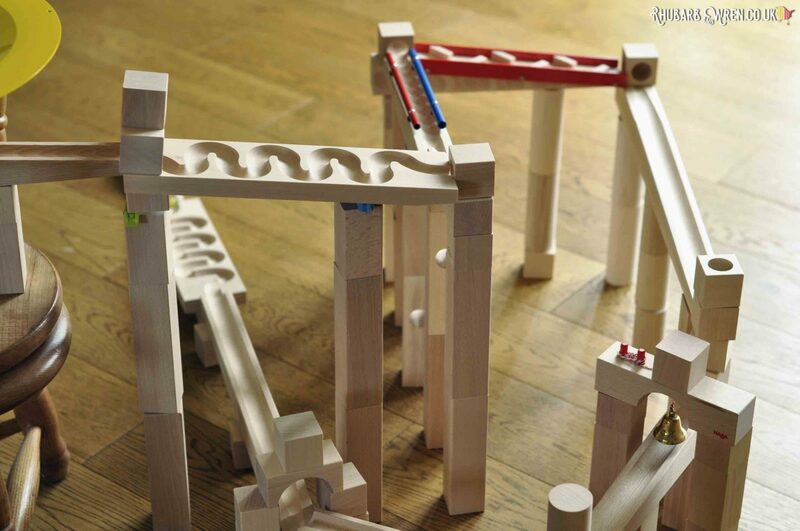 A marble run is the ultimate STEAM (or STEM) toy for kids. Do you like the look of our marble run? The set used in the pictures in this article is (affiliate link) HABA’s Master Building wooden marble run, along with the add-on Winding Track section. 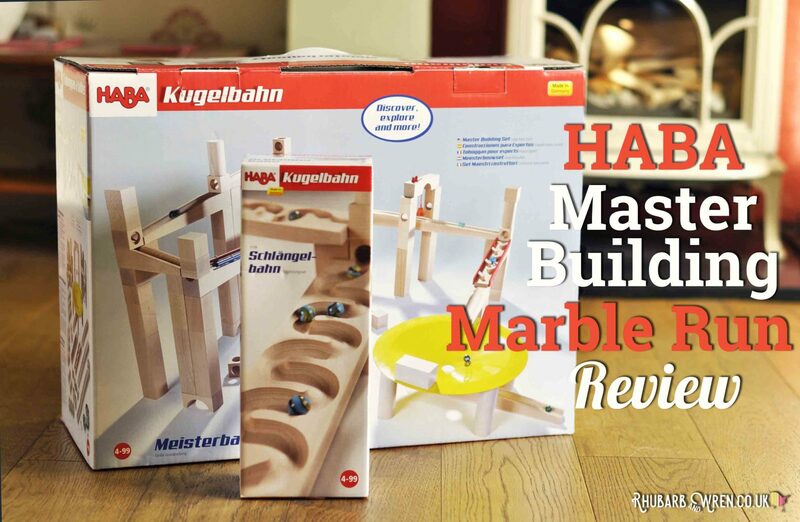 We were lucky enough to be sent these toys by HABA in return for an honest review, and so you can read about how we got on with it, and what we think of HABA’s marble runs generally, in our other marble-tastic post – the HABA Master Building Set Review.